The Happy 101 Award has made it to Desperately Seeking Surnames thanks to My Nola Heritage. Thank you Felicia for thinking of me! In keeping with the theme of this award I will list 10 things that make me happy as well as choose 10 blogs that bring a smile to my face. The biggest pieces of my happiness come from family and friends. Even though they generally do not "get" my genealogy hobby, most will humor me and listen for a while before their eyes glaze over. My hobbies also greatly add to my happiness, I love genealogy and reading and probably spend too much time on both. The remainder of my happiness circle is filled with such randomness it's funny: Starbucks Venti White Mocha, technology (blogging, Twitter, Facebook, Ancestry.com, Smart Phones and iPods), vacation, Mr. Sushi (Lee's Summit roll), Oh! Henry candy bars (so hard to find these days) and last but certainly not least this very welcoming, supportive, informative, hilarious and sometimes outlandish genealogy community! Now for the hard part, narrowing my choice of blogs that make me happy down to just 10. Of course, these are in no particular order. 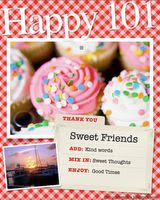 Thank you so much for the Happy 101 Award! I'm honored to receive it from you. After all, it's like a People's Choice Award for actors! And that's cool! Once again, thank you for the Award! So much appreciated! You are welcome Sherry! Yes, you mentioned the Harts before. I have just touched on the Hart line and so far they are all in Kentucky, unsure where they came from. Hi Jenna! I was just re-reading your surnames, and realized that you have some Allen's there. I've got Allen's in mine as well, but I have dug into that yet, and may not anytime soon. It's 'back there' a ways. We are supposed to be related to a 'famous' one. Sherry, my Allens are from Kentucky also, an Allen married a Hart.